Tammy Roark and her husband Rob began showing Somalis in 1995 when they adopted two littermate brothers from the Ciderhouse cattery, purchased "just as pets". These two boys went on to become the first two grands from the Ciderhouse cattery and GP, RW Ciderhouse Sebastian was a regional winner in Premiership and Best Somali in Premiership for two years in a row. 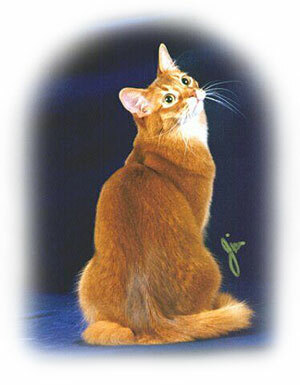 Once Tammy and Rob become "hooked" on the Somali breed and cat shows, they purchased their first breeding female, and started the Tamarakatz cattery, in the spring of 1996. From that very first litter, a female kitten that they kept for their breeding program became their very first DM. 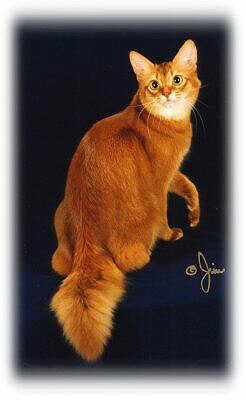 As of March 2004, they have produced 16 homebred grands (including 5 females, which is quite an accomplishment in the Somali breed), and they have earned 9 regional wins with cats of their own breeding. They have had the best Somali in the Northwest Region every year since the 1998-99 show season, and have also had two National 3rd Best of Breed wins, and one National Best of Breed in the past three show seasons. 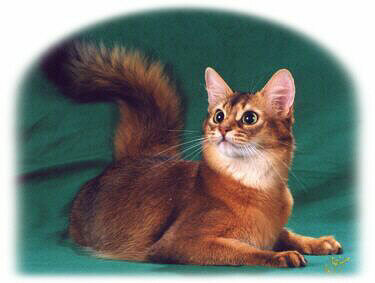 Grooming a Somali for showing is not a difficult task. There is no color enhancing, no trimming, no plucking, etc... <VBG>. I only use a small greyhound style comb for the coat. Naturally, you want to start getting your cat accustomed to regular baths well before the start of its show career. Never wait until the day before the show to give them their first bath. You need to be bathing your cat regularly to get its coat into condition... and keep it that way. This is really no different than for any other breed. If I'm showing a cat on a regular basis, it usually gets a bath every week regardless of whether we are actually going to a show that weekend. If I am campaigning and showing almost every weekend, I will occasionally skip a bath on a non-show weekend, just to give the kitty a break from the bathing routine. If the cat has a particularly greasy coat, I never skip a weekly bath. I try to always do my show baths the night before the show, but sometimes I have to do it on Thursday, especially if I am flying. If I have to bath early, I add an extra degreasing shampooing into my routine. The first step in the show bath is to "Goop" the cat. Wet the cat first, then apply the Goop. The greasiest areas on a Somali are the chest, behind their ears, and the front of their back legs (knees). Pay extra attention to these areas, with ALL of the shampoos AND rinsing. Work the Goop in well, and then rinse it out. The next step is to wash the cat in Dawn Dish Detergent. Again pay the MOST attention to those greasy areas, and work the shampoo in well. Rinse it out. My first mentor told me that you should always rinse at least twice as long as you worked with the shampoo and I still think this is good rule to follow. The third step in the bath routine is another degreasing shampoo. My all-time favorite is House of AnJu's original "stud tail" shampoo. I also use Therapet "Grease Remover" shampoo, available at Dog's Outfitter. I like it "almost" as much as the House of AnJu product. The Therapet shampoo is very creamy, and produces a beautifully rich lather. Another alternative for a degreasing shampoo is one called "Filthy Animal High Concentration Shampoo", although I personally prefer the Therapet product. If I have a particularly greasy cat (like my stud boys), I sometimes do an extra lather and rinse with the third degreasing shampoo. I also do an extra lathering if I have to do a show bath on Thursday instead of Friday, such as when I am flying to a show on Friday morning. This helps the bath to last longer. What I don't want to see are the hairs of the coat starting to separate during the show. The last shampoo I use is Thermasilk - the Volumizing formula. It's a very quick "on/off" with this one, as it can make their coat greasy if you use too much, leave it in too long, or don't get it rinsed out completely - so use with care. I've only had one Somali I ever had to use a conditioner on. I used Infusium 23 Conditioner and it worked beautifully. I found that I could use the 5-minute deep conditioner on him one week, and then just use their conditioning shampoo the next week. Two weeks in a row of conditioner was "too much", but trying to skip it altogether didn't work either. Every cat's coat is unique and you do have to experiment to find the perfect bathing routine for each individual. Don't do the experimenting for an actual show bath, though! I prefer to use an Oster table dryer - the kind that you can sit on the counter and that has an adjustable nozzle. It has 4 adjustable speeds. I start by placing the cat in a carrier and directing the nozzle of the dryer towards it. I dry for about 10 minutes with the dryer blowing set on the "next to high" setting (one down from the high setting). After that, I take the cat out and begin hand drying, still using the Oster dryer. I start with the chest, combing upwards towards the chin, with the dryer pointed at the chest. I dry the front of the cat first, then stand them up on their hind legs (supporting their front legs with one hand, while I'm combing with the other hand), to dry underneath their front legs and down their tummy. When that's all dry, I dry both sides of the cat, from the ears back to the midsection of the cat, one side at a time. Then I turn them completely around, and dry the bottoms of their rabbit feet, and their pantaloons. Then I work on one side or the other, knees, top of back feet, inside the back legs, up the outside of the hip/flank. I finish with their tail, and I also comb that "backwards", from the tip of the tail, towards the base of the tail, with the dryer pointing from the tip, towards the base. If you leave your cat with any dampness left in the coat, the hair will curl and separate. The best bath in the world will not produce good results unless the cat is properly blown dry. In the showhall, I use a Bio-Groom texturizer that also has an antistatic effect. I only use it once, at the beginning of the day. I spray my hands with it, working it backwards through their coat, and their tail. Let it dry, then comb it out. Before each ring, I just run a comb through their coats, fluff their tails, and off we go. For coats that are separating/falling apart, I also use Fullers Earth. Sprinkle a bit on your hands, work it into the coat (chest, behind ears, front of back knees), and then "blow" it out, by blowing on the cat. BTW, the cats don't tend to like that part. If static in the show hall is particularly bad, I sometimes use Sea Plasma spray to control it, just before a ring. Only use it ONCE for the day though - if you use it for every ring, you'll have too much built-up "gunk" in their coat. It seems to hold for an entire day quite well. 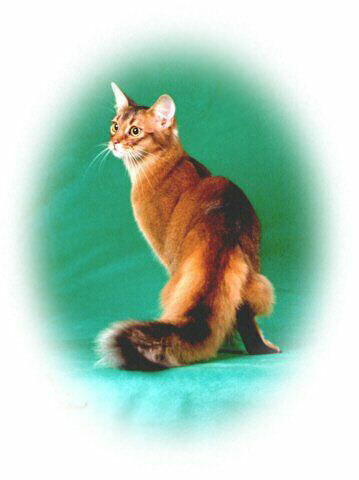 A beautifully groomed Somali should have a shiny, glowing, gorgeous, flowing coat and a full tail. Every hair on the coat should be distinct but with no breaks, lines, or separations in the coat that would distract from the beauty of the cat. 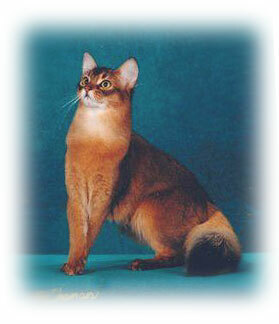 The cat should give you an overall impression that reminds you of a beautiful little fox!